Just when you think that it is safe to venture out again into the big wide world; wham ! Singapore SONEs get hit with more TaeTiSeo goodness in the newsstands. 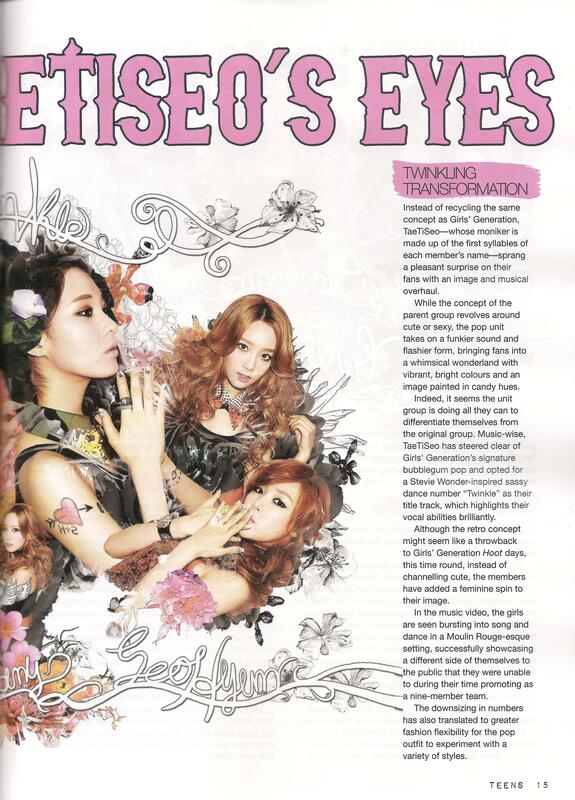 Coming hot on the heels of their recent promotions in Korea, Soshi’s newest sub-unit gets featured in the July issue of “Teens” magazine, a Singapore publication that showcases the latest trends in the music and film entertainment industries. As evidence of their success in the K-Pop music industry, TaeTiSeo has been given the privilege of being the cover story for this newest issue of this entertainment magazine :). In the article, the writer gives a glowing account of the successes of the 9 Soshi ladies in general, and focuses on the 3 “earthly angels” of TaeTiSeo in particular ;). Their musical style in this new mini-album has been liken to that of Stevie Wonder, a well-known musician/song writer and 80’s entertainment icon. 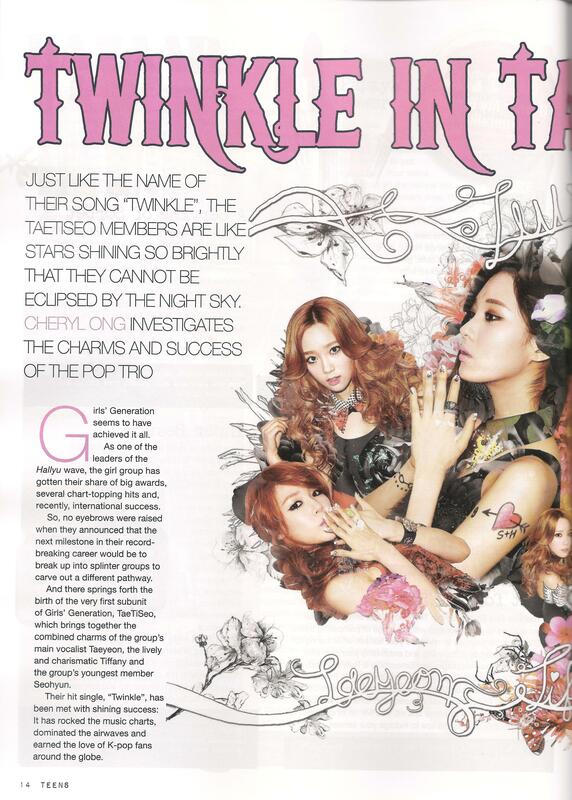 Principal to this is “Twinkle”, the cover song and title of this mini-album. The writer also gives a glowing account of the other songs in this EP release from SM Entertainment, calling them sassy and trend-setting. 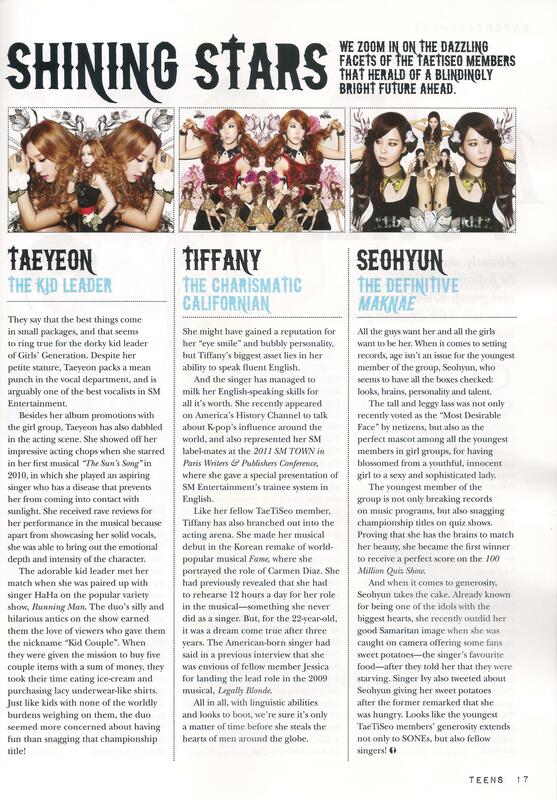 In fact, according to the article writer, the choice of songs in this SNSD sub-unit EP actually showcases the vocal abilities of the 3 Soshi ladies extremely well, a fact not lost to the music-loving public world-wide, as evidenced by the coveted Triple Crown win on all the major music programmes in Korea the month that they were promoting the album’s title song “Twinkle” :D.
The article finally ends with a short, sweet, but, oh so informative, “thumb-nail” analysis of our 3 Soshi ladies; a real joy to read indeed :). 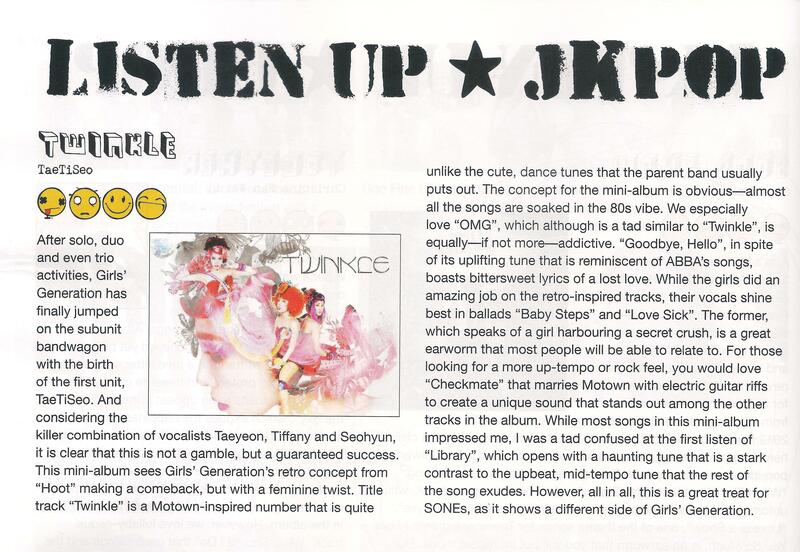 As a bonus, a review of the “Twinkle” mini-album is also included in this issue of the magazine, and I must say that it gives a really enthusiastic overview of this latest musical gem from Soshi and SM Entertainment. So, without further ado, read-on for the verbatim magazine article itself and enjoy 😆 ! Good to see TaeTiSeo still making an impression on the world. ^^v jjang! if my memory serves me correctly was it not seconds not minutes, because Fany was talking in reference to her lines in Twinkle? Indeed, it was seconds, not “minutes”. The Twinkle album is only around 30 minutes long!